If you're hoping to keep your children occupied this winter, then you're no doubt looking for kids' winter games to keep their bodies and minds busy. The best way to keep from hearing your kids utter that familiar winter refrain, "I'm bored," is to have a variety of games and activities at the ready. Then, the next time you see a child wandering around looking lost, you can pull out a fun activity that will keep him or her engaged and occupied. Winter presents an interesting challenge to many parents. Sometimes the weather permits your kids to go outside and run off some of their boundless energy. Other times, your kids are trapped indoors looking for something to do. 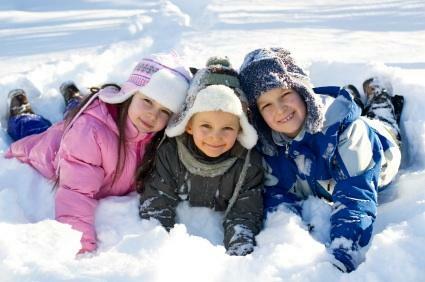 That's why you need to have kids' winter games ready with both indoor and outdoor activities. Depending on where you live, your opportunities to go outside may be fairly limited in the wintertime. Still, when the weather permits, outside is the place to be. Try these fun snow games with your kids. Snowman Hat Toss: The fun starts when you make a snowman. Once you've gotten your snowman completed, it's time to top him off in style. Select a hat that retains its shape when you toss it. Take turns having kids toss the hat at the snowman, trying to get it to land on his head. Snowball Roll: Team kids up or have them work individually and see who can roll the biggest snowball. Target Practice: For kids who like to throw snowballs, give them a target other than your backside or another kid's head. Set up a target, such as a pyramid of empty soda cans, and have kids take turns pitching snowballs at the target to try to knock it down. Alternatively, you can place a hula hoop on the ground (or hang it from a tree branch) and have kids take aim at tossing snowballs through the hoop. Slippery Tug of War: Get teams of kids together to tug on opposite ends of a rope. Playing tug of war in the snow makes it a whole different experience. Obstacle Course: Build a kid-sized obstacle course out of snow with your kids. Make obstacles for them to jump over, weave in and out of and climb. Follow the Leader: This is a snow version of the classic. Have one person walk through the snow in a pattern of his choosing. Now have other kids follow behind, trying to step exactly in the original footsteps so that it appears that only one person has walked through the snow. If it's just too cold, wet, or dark to play outside, then you may want to try some of these fun, indoor games for kids. "Snowball" Sheet Toss: Clear a space in the middle of a large room. Divide into two teams with each team standing on one side of a bed sheet that is stretched between the two groups. Blow up a white balloon and place it in the center of the sheet. Each team's goal is to shake the sheet so that the snowball winds up on the other team's side. Winter-themed Pictionary: Write a large number of winter themed words on separate pieces of paper, for instance "skiing" and "snowman." Divide into two teams. Have each team take turns drawing a piece of paper and then trying to communicate the word on the paper via drawing in a prescribed amount of time. Winter-themed Charades: Have teams select books, movies and television shows with a winter theme and use standard charades rules to communicate them to their teammates. Pin the Glove on the Snowman: This game is a winter-themed version of pin the tail on the donkey. Tape a drawing of a snowman to the wall. Give kids a paper glove, spin them in a circle with a blindfold on, and then have them try to place their glove as close to the snowman's hands as possible. Every parent needs a bag of tricks, especially in the winter. Keeping your kids occupied during the winter months doesn't need to be a challenge. By having winter activities at the ready, you will keep your kids busy this winter - no matter what the weather.